In recent years there has been an explosion of interest in artisan food of all types, and chocolate has been no exception. Connoisseurs of chocolate started to clamour for chocolates with increased cocoa content, which is a more challenging experience than sugary milk chocolate favoured by high-street brands, but is a much more authentic chocolate experience. This then developed into pairing dark chocolate with interesting flavours, and sometimes textures. One of these flavours is chilli. Whilst it might be new to us, chilli and chocolate have a long-standing, traditional relationship in chocolate's ancestral home in Mesoamerica. Indeed, the chocolate of the indigenous Americans would have been very different to ours. They didn't have refined sugar, so would never have mixed it with that, or milk. Instead, chocolate was used throughout their diet, in both sweet and savoury dishes and was often paired with spices, including chilli peppers. 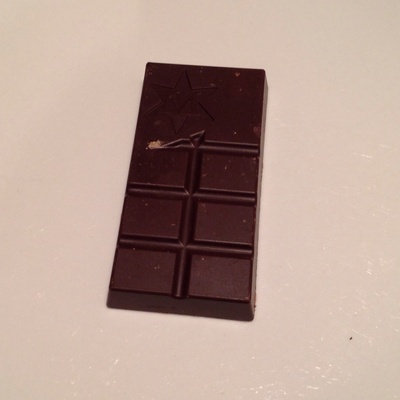 Not a bar that's easily halved for sharing, as it's not split into symmetrical pieces. 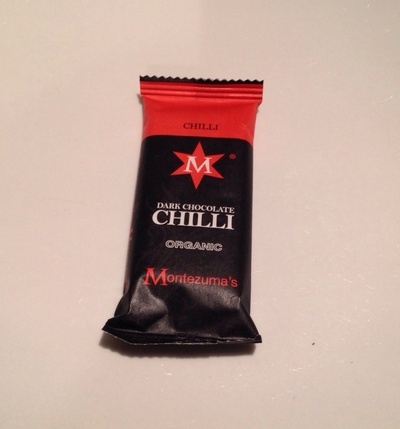 The brand of chilli-flavoured chocolate that I tried was Montezuma's. They are a UK-based luxury chocolate brand, founded on a passion for both chocolate and fairly-traded products. Their genesis was in Brighton, over 13 years ago, where they began by creating chocolate truffles, and they have grown and grown until their range now contains over 250 product lines. One of their enticing options is a chocolate subscription club - pay a monthly fee and receive a selection of their delicious artisan chocolates. So, how did their chilli-flavoured chocolate fare? To begin with, it tastes like a very-good quality dark chocolate. It has a high cocoa content, but melts very easily and smoothly in the mouth. When it starts to melt is when you start to taste the chilli kick. It's not overpowering or too hot, and it adds an extra dimension to the chocolate flavour. It is a chocolate that you should eat slowly, so you can really appreciate the layers of flavour and how they change as the chocolate melts. This is a not a chocolate for when you are looking for a simple chocolatey sugar-hit on the move, or in a rush. It's a chocolate to be savoured, perhaps at the end of a meal or a really bad day. It might be a slightly challenging experience, but it is definitely worth broadening your horizons and trying it. I'd love to hear how you get on. Is chocolate paired with chilli for you? What other unusual flavour combinations do you like with chocolate?